I've been waiting for some phone calls this morning and I remembered these great ceramic skulls I got from Jennifer Heynan of Jangles. (It looks like she's out of skulls, but if you scroll down she's got pumpkins, ghosts and cats that'd be great substitutions.) I've been meaning to make something with these skull beads for quite some time and with a few spare moments here, I whipped up this jaunty little Goulie Girl necklace. I used carnelian beads, three strands of fancy gun metal chain I bought from Rings and Things and some dark annealed iron wire I bought from Metalliferous. The wire is cut into short segments and used to create a rosary style chain to connect the beads. Basically I just added a loop on each side and connected them. You could also opt to add jump rings in between. If you use iron wire, cut it with Memory Wire shears and not regular cutters, it'll chew up a regular cutter blade in a flash. I have been mad for bows this season, so I couldn't resist adding one on here. I love how this is part whimsy, part fashionista...for your inner Goulie Girl. Until next time....craft on with your bad selves! For the edification of the FTC, the gun metal chain and skull beads were given to me for use in my design work and I purchased the rest of the materials in the above project. I love the addition of the black bow to those cute skulls! Beautiful piece, as usual. Margo, I LOVE this necklace! Beautifully crafted! I'm going to start embracing my inner ghoulie girl :) Love your designs! 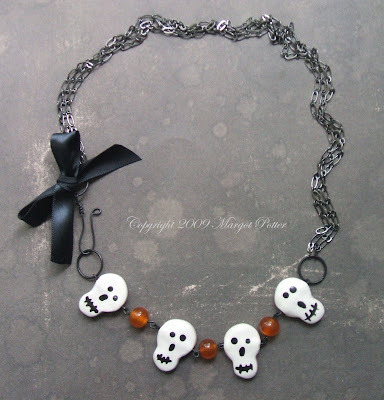 What a sweet necklace, perfect for a night out with the ghouls! I love the little skullys! Too cute! I love the little details...they make it extra sweet. I seriously need some Halloween jewelry - thanks for the inspiration!